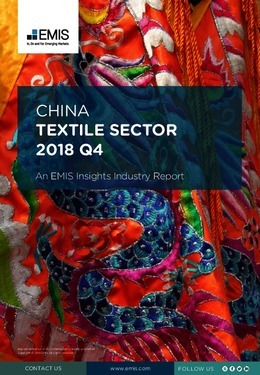 China textile sector’s revenue in the third quarter of 2018 plunged by 32.5% y/y to RMB 708.5bn, due to decreased sales of textiles. The production of textiles continued to decline in Q3 2018 because of increasingly stringent environmental protection policies. Yarn production in the third quarter of 2018 slumped by 33.3% y/y to 7.3mn tonnes. The output of cloth and cocoon silk and its intertexture in Q3 2018 were down by 31.7% and 22.9% y/y, to 12.4bn metres and 126.5mn metres, respectively. The production of wool fabric during this period dropped by 21.7% y/y to 104.8mn metres. This report provides a complete and detailed analysis of the textile sector for China. EMIS Insights presents in-depth business intelligence in a standard format across countries and regions, providing a balanced mix between analysis and data. Gain an understanding of the regulatory environment for the sector in China.